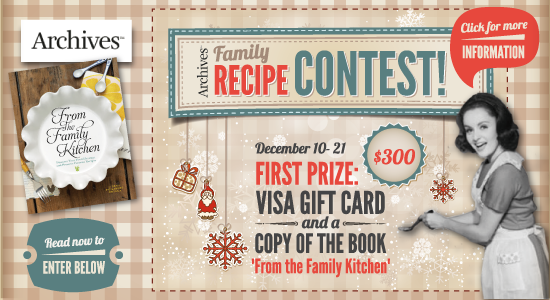 First, second, and third prize winners will also receive an autographed copy of From the Family Kitchen: Discover Your Food Heritage and Preserve Favorite Recipes by Gena Philibert-Ortega (Family Tree Books, 2012). Entering is easy. Click here for the official submission page and enter your family's recipe and the story about why the recipe is so special. Was this what Grandma always saved her pennies for so she could get all of the ingredients? Is it one of those wacky recipes that nobody actually eats, but makes people disappointed if it isn't on the table? Entries will be judged on uniqueness, creativity, and the family story behind the recipe. These special foods are not only tasty, but they bring back wonderful memories of holidays past and the people who made them before us. They are a part of our families' histories. Winners will be announced Friday, December 21, 2012.